Application that detects head position from a depth image provided by Microsoft Xbox Kinect Sensor in x,y,z and Euler Angles (pitch, yaw, roll) from multiple persons. all arguments are float, angles in degree, User_ID starting at zero. * can detect angles about +-75° yaw, +-60° pitch and +-50° roll. Ready to use Binaries for OSX (64 bit) and Windows (32 bit) are included. Windows version is compiled for Microsoft Kinect SDK!! adjust path settings for Frameworks and build it. 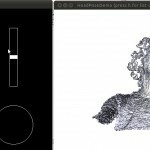 Dieser Eintrag wurde veröffentlicht in news, software und verschlagwortet mit angle, depth image, euler, fanelli, head tracking, kinect, osc, pix_head_pose_estimation von matthias. Permanenter Link zum Eintrag.